The Individual Appliance Monitor (IAM) I ordered from Current Costs arrived yesterday. 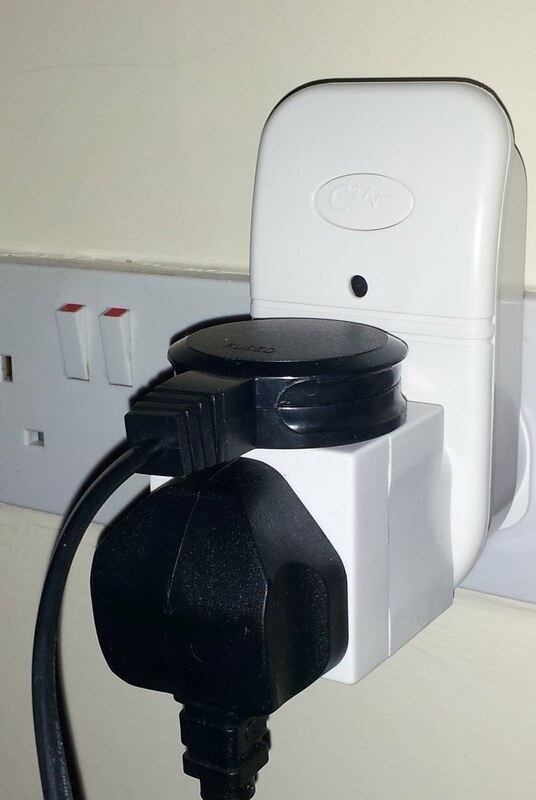 This is a device that I can insert between the plug of an appliance and the wall socket that will then send data to my home electricity monitoring system about how much electricity is being consumed by the device(s) plugged into this socket. This will enable me to analyse the power consumption of individual devices more accurately. The first thing I decided to look at was the amount of energy being consumed by the television in my living room. I have often heard people say that it is possible to save a significant amount of power by completely switching off your television rather than just leave it on stand-by where it can be switched back on again with the remote. I have always been sceptical of this information and the measurement from the IAM indicate that it is not drawing any power while in stand-by mode (or at least the power being consumed was too small to register and the IAM is capable or registering a single watt of power). Therefore, I conclude that it is not worth my while to unplug the TV from the wall every night. When I turn on the TV, but leave the cable decoder box switched off the TV begins to consume about 100 watts of power (it is showing a blank screen). When I switch on the cable decoder box and begin watching something on the screen, the amount of power being consumed by the TV increases to about 200 watts. Therefore leaving my TV permanently switched on would cost about 20 euro per month, which would be a significant amount of money to waste. I get television service from UPC and the package I have signed-up for includes the ability to automatically record all episodes of a program. Naturally for this feature to work I need to leave the decoder box constantly connected to power and in stand-by mode. When the box is completely in stand-by mode it consumes about 8 watts of power, but once it is either switched on or starts to record a program from my preferences its power consumption raises to about 20 watts. Therefore the TV recording service is effectively costing me between 1 and 2 euro per month in power in addition to the subscription costs from my cable provider. I think this is quite reasonable.